Pop star Michael Jackson has refinanced his Neverland ranch to save it from being auctioned off, his lawyer says. Mr Jackson had been told that if he failed to pay $25m (£12.5m) he owed on the sprawling California property, it would be auctioned next week. L Londell McMillan said the singer had now worked out a "confidential" agreement with an investment group which meant he would keep the property. "Neverland and MJ are fine," Mr McMillan said. The deal had been struck with the Fortress Investment Group, he added. The reclusive singer owed more than three months' arrears on the property. If he failed to make the payments, the auction was due to go ahead on 19 March. 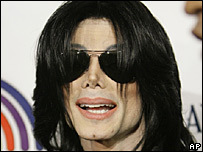 Matt Fiddes, a family friend of Mr Jackson and his brothers, said the problem had been exaggerated by "tabloid gossip". "I know for a fact that he wasn't going to lose it," he told the BBC News website. "It's not a problem - Michael's keeping Neverland." He added: "I've spoken to his brother, Tito, about it and it's not like it is in the papers. "It's quite normal for anyone who's a success to have a mortgage on their property because they can get better rates for their money." The star, best known for songs such as Bad, Thriller and Billie Jean, has not lived at the property since his acquittal on child molestation charges in 2005. 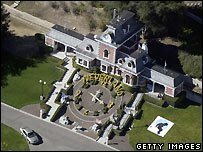 He bought Neverland in 1987 intending to create a fantasy land for children. It is named after an island in the story Peter Pan, where children never grow up. After he purchased Neverland, Jackson built a zoo and fairground on the 2,800 acre (1,100 hectare) property north west of Santa Barbara. It was closed in 2006 after he failed to pay his staff or maintain proper insurance.